Click on right bottom corner of each photo to enlarge. This is even prettier in person because you can see farther up onto a little hill. One of the nicest views you would want to dine by in Florida. Scroll down for more photos. Centrally located 3 miles from High Springs, 15 to Itchetuknee & tubing, 15 minutes to Ginny Springs. 2 minutes to High Springs & major grocery store & restaurants. Very comfortable recliners. Wood doors lead to Bunk room. 32 inch Flat screen, A/C, heat,oven,mircrowave, large refrigerator, WiFi, coffee maker,toaster, electric fry pan, linens,video library. The Master bedroom below is a Queen size. "This photo lens makes it look smaller but it is a Standard Queen bed with memory foam & pillow top mattress pad for extra comfort. Access on both sides & bottom. Window. The bedroom door closes off from the bathroom & the rest of the rental. The toilet is in a seperate room so your friends or family in other room won't disturb you. It also has an electric ceiling vent & fan in the toilet room & it's own door. The bedroom has it's own exit door also. The toilet room has it's own door for added privacy & electric exhaust fan & sky light. Full Kitchen,HouseRefrigerator, dishes,coffeemaker,microwave free WIFI, Central A/C, Satelite TV, electric heaters, Private Washer & Dryer access (see diagram below), hair dryer, oven,electric skillet,toaster,pots & pans & linens. Click on right bottom corner of each photo to enlarge. The Beds below are standard Twin size beds custom bed with no squeeking with very comfortable mattresses. Both bedrooms have doors that close for privacy. A folding bed for this room is available. This is a 6 foot man to show size of bed. Below,your private Laundry facilities with an extra shower, place to hang wet suits & charge equipment aprox 125 feet from your cabin, walk or drive up to it. You will recieve your own key. Also has fans, A/C & small elec. heater. Wifi, can be used as office. Click on right bottom corner to enlarge. 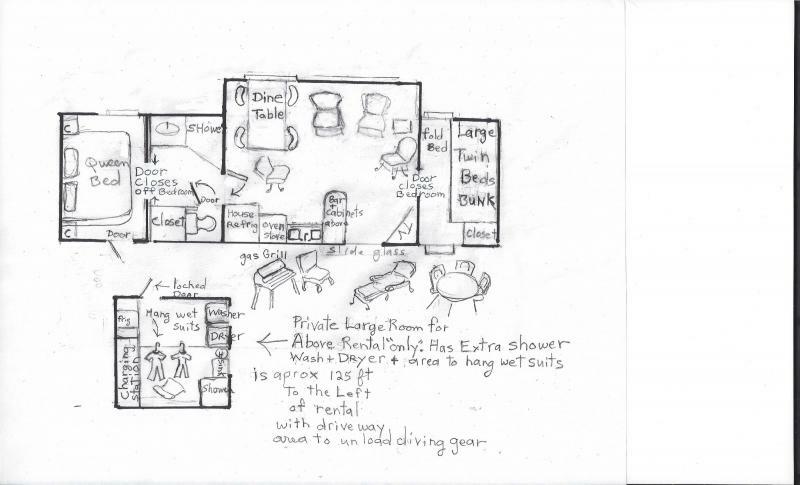 Below, this is the floor plan of the rental plus the floor plan of above room. CLICK right bottom corner to ENLARGE. 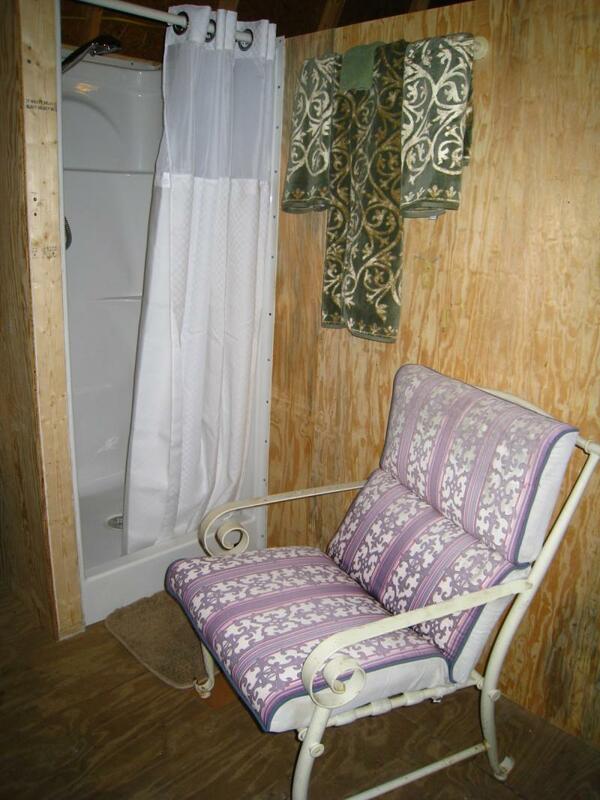 Here Below is the extra shower in the large seperate laundry cabin. Locks up for privacy.